Have you ever wondered what makes a certain house desirable? Think about it. What do you look for when buying a home? According to a study by the National Association of Home Builders one of the main driving forces is the design and layout of the home! 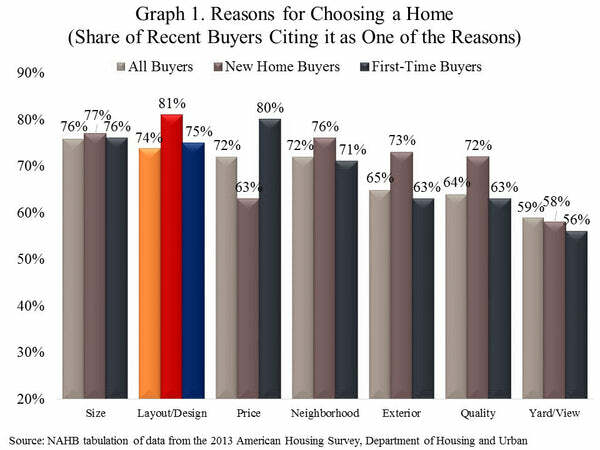 Now of course there are a ton of other factors, but design is one of the most important factors in choosing a home, especially for people in the market for new homes. With everyone still coping with the recent recession, people are looking for homes that they can grow into. Homes that are not too big, but big enough to raise a family. These homes are roughly between 2300 and 2500 square feet. The multi generation homes are easier to maintain esthetically and financially. The spaces and rooms can also be changed when need be. A simple room can be a baby nursery one moment and an art studio in the next. The Tres Le Fleur House Plan is the best example of a Forever Home with just 2499sqft. No walls or limitations. These layouts offer a lot of flexibility for the ever changing family. Having a free flowing space between the kitchen, dining area, and family/living room allows for everyone to be within distance. The Fairhope Home Plan has a clear and open space for optimum flexibility and creativity for the homeowner. Being able to connect indoor and outdoor living is remains to be prominent in choosing a house. Having your own personal oasis in your backyard is exciting and cost effective in the long run. Outdoor cooking areas and pools will give the home flexibility and show that the " party" can continue outside of the home. The Luxor House is just one illustration of how outdoor living can play into the overall layout of a home.